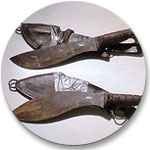 TOMAR'S KA-BAR KNIVES-Product and Quality Control Testing Methods. TOMAR'S KA-BAR KNIVES-Product and Quality Control Testing Methods. 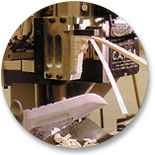 One of a handful of machines like it in the world, the CATRA tester uses controlled pressure, stroke length, number of cycles and a certified sand-impregnated paper to determine the sharpness and edge-holding capabilities of a blade. * CATRA stands for Cutlery and Allied Trades Research Association. KA-BAR Rockwell tests its knives to determine the hardness of the steel. A diamond brale presses into the blade and makes an indentation. The harder the steel is the higher the Rockwell reading. Rockwell is reported in ranges and is often identified with the letters HRC or RC. e.g. HRC 60-61. 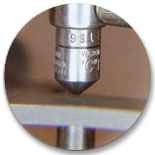 A goniometer measures the edge angles of a knife by using a laser beam. 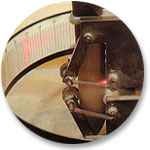 The laser beam is aimed at the cutting edge of the blade and is split by the honed edge onto a protractor that reads the edge angles of the blade. © 2004 All Rights Reserved by KA-BAR Knives Inc.
To view the construction of a KA-BAR knife and the steps involved with quality and control, click here.